Variations in human thermal perception have been described on timescales from minutes to seasons. However, the effect of weather-related thermal extremes on inter-daily changes to outdoor thermal perception has not been well characterised. This study used human thermal comfort data from an outdoor botanic garden in sub-urban Melbourne, Australia as a case study. 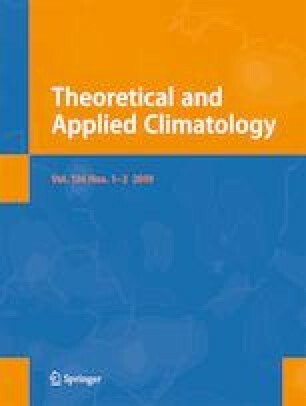 We examined inter-daily variations in local visitors’ thermal perception before (11–12 January 2014) and after (18–19 January 2014) a severe heatwave from 14 to 17 January 2014, when daily maximum temperature exceeded 41 °C for 4 consecutive days. We compared thermal comfort survey results (pre-heatwave: n = 342, post-heatwave: n = 294) with air temperature and the Universal Thermal Climate Index (UTCI) measurements. Even though the days preceding and following the heatwave had a similar range in temperature (19–25 °C) and UTCI (26–32 °C), the visitors felt cooler in the days following the heatwave (i.e. lower thermal sensation votes). In the 2 days following the heatwave, visitors also wore less clothing compared with before the heatwave. Our results show that the thermal perception of visitors changed significantly following their exposure to the heatwave, even after controlling for changes in clothing choices and the ages of survey participants. Psychological adaptation to heat (such as thermal history and expectation) might be one of the possible explanations for this inter-daily variability of local visitors’ thermal perception. The authors acknowledge the CRC for Water Sensitive Cities and the Royal Botanic Garden (RBG) Victoria for their support, as well as the volunteers from the RBG Victoria and Monash University for conducting the surveys. We thank Dr. Margaret Loughnan for her support in designing and implementing the survey. In addition, we would like to thank Dr. Lynette Pretorious, Basil Cahusac de Caux, Cuong Huu Hoang, and Ricky Lau, for helpful discussions during the preparation of this manuscript. This study has approval from the Monash University Human Research Ethics Committee—project number CF13/3260-2013001699. This study is financially supported by the National Natural Science Foundation of China (Grant No. 51478486) and the National Natural Science Foundation—Outstanding Youth Foundation (Grant No. 41622502) as well as the Science and Technology Program of Guangzhou, China (Grant No. 201607010066).